The Brick Dad - Reviews, News, MOCs, and More! I’m back with today’s LEGO® City Advent Calendar gift from day 12! Today I was pleasantly surprised. This is an Ice Cream machine! LEGO® has done a great job with this design. It has a clever use of elements in such a small package. 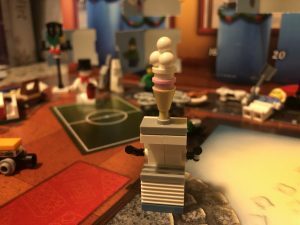 There are two levers to dispense the ice cream, and a place to store a cone on top. I would guess we may see the proprietor of this Ice Cream stand, if not I know the perfect place for it in my winter village. So far this Advent Calendar is hit and miss, but mostly hits for me so far. What about you? Beloved Son, Husband, Dad, Adult Fan of LEGO®. © 2019 The Brick Dad, All Rights Reserved. LEGO® is a trademark of the LEGO Group of companies which does not sponsor, authorize or endorse this site.